Fifty years ago, on August 1, 1966, Charles Whitman positioned himself on the top floor of the University of Texas Tower with an arsenal of weapons and opened fire, holding the Austin campus hostage for 96 minutes. When the gunshots were finally silenced, the toll included 16 dead, three dozen wounded, and a nation irrevocably traumatized by one of the most seemingly senseless and random mass murders in U.S. history. National traumas now seem to be de rigueur for the U.S. Followed by 9/11, one mass shooting after another and, most recently, by the election of Trump for president, we are a country with a hand to its mouth, either at a loss for words or choking on them, when it is clear that the sense of words, their capacity for reason and persuasion, are being crushed underfoot by forces larger than we can understand or, fearfully, even control. 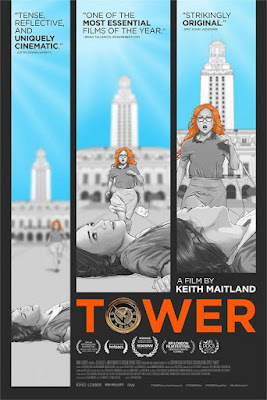 At Tower's consideration screening in San Francisco, filmmaker Keith Maitland was the first to apologize for the weight of his film's topic piled on top of an already oppressive week. Tower, inspired by Jessica Colloff's article "96 Minutes" published in Texas Monthly, premiered at SXSW, winning Best Documentary Feature, going on to score the Grand Jury Prize at the Dallas International Film Festival and the Audience Award at the Riverrun Film Festival. 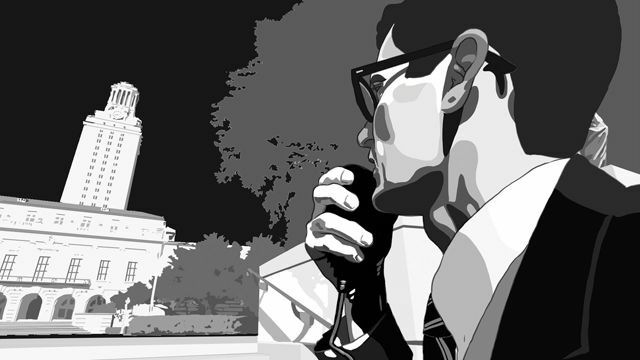 It's now opening across the country and is a powerful meta-documentary detailing the events of that fateful afternoon, incorporating archival 16mm footage, broadcast radio reports and re-enactments brilliantly visualized through rotoscope animation. 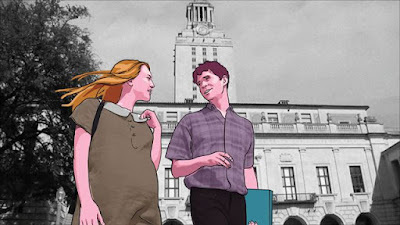 Tower's crowning achievement, however, is to eschew the kneejerk response to psychologize and justify Whitman's actions, opting instead to seek out the voices of those on the ground looking up at the tower witnessing events. Diarist Anaïs Nin once wrote: "Passion is a narrow lens." This is precisely the emotional point of view adopted by Maitland to present the facts as known (yet rarely discussed). A sense of immediacy, alarm and helplessness characterize and strengthen Tower's aesthetic objective. That objective is further achieved through Maitland's judicious editing, which serves to connect events from 50 years ago to our current moment: specifically the cultural tendency to vilify ethnic groups as violent. Recounting events in Tower, when police officer Ramiro Martinez responded to the scene, he recalled looking up at the many windows of the clock tower and imagining a Black Panther with a rifle behind every window. Martinez gave many interviews after the August 1 event with slight variations in his recollections. In an earlier interview he stated he imagined a terrorist at every window and significantly later his comment about the Black Panthers, which Maitland incorporated into his film. However, the Black Panther Party was not officially formed until October 1966 so it would have been impossible for Officer Martinez to have this fantasy when he approached the tower. Maitland admitted to purposely selecting this recount of events over others to accentuate the ongoing demonization of people of color. He had to clear it through Martinez's family who, at first, were reluctant but who finally granted permission once Maitland made his thematic objective clear. 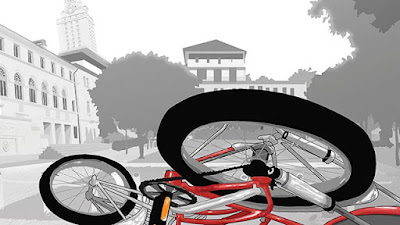 One of Whitman's first victims was Claire Wilson, an anthropology student eight months pregnant who was shot while crossing the quad with her boyfriend. Both he and her baby did not survive; but, Wilson lived, singlehandedly due to the efforts of a woman named Rita Starpattern who rushed to her aid despite the continued sniper fire from the tower and kept her talking and conscious until help could arrive. Maitland admitted that it was this moment of bravery that inspired him to make the film. And it is this moment that recalls me to what my mentor Joseph Campbell termed tat tvam asi, a Sanskrit phrase translated as "thou art that." What is it in the human animal, Campbell posed, that causes an individual to risk their lives for another without fear of losing their own life? He implied that the answer was an interconnectedness between human beings, an inseparability, a recognition that—as quantum physics would suggest—we are not separate creatures after all but interdependent at every level. Rita Starpattern, who went on to become a well-known artist and feminist in the Austin scene, later admitted to her partner that this selfless act on her part was one of the stupidest things she had ever done; but, in the moment, she had no choice but to help keep this wounded pregnant woman alive. For me, this is the film's pivot. It also speaks to our need as a nation right now to recognize that we are at an equal pivot. Either we are all here for each other to save each other from the monsters among us, or we are doomed to be picked off randomly one by one. Recognition and choice and action are all we have left. The Second Annual Report of the reconvened CAMERA OBSCURA is scheduled for Thursday, 18-November, to Sunday, 20-November, at the historic Hotel Petaluma. In 1957, shortly after Frank Stauffacher’s like-minded “Art in Cinema” SFMOMA series ended, the original CAMERA OBSCURA Film Society (COFS) was founded by Lawrence Jordan and Bruce Conner together with Willy Werby, Roger Ferragallo, Ben Payne and a handful of others. Their eclectic programs “presented solely in the interests of advancing an appreciation of the cinema and of fostering a vital link with present day filmmakers” continued until the organization ceased to exist in 1962. The First Annual Report of the reconstituted CAMERA OBSCURA occurred with great fanfare over two evenings in December of 2015. The committee for CAMERA OBSCURA consists of co-directors Amanda Salazar of the San Francisco Film Society and Jonathan Marlow of Kanopy, former colleagues committed to evoking the spirit of the original COFS. The revitalized and expanded event represents a festival of recent and restored narrative and non-fiction works premiering regionally along with several work-in-progress screenings. The aforementioned filmmaker Lawrence Jordan will return to premiere his latest film and introduce a documentary of his selection. Numerous other guests will also be in attendance. Events are for members-only and presented on behalf of COFS. A half-day membership (for a single screening) is $20. A full-day membership is $50. A one-year membership (including a full pass for all of the weekend events and subsequent Quarterly Report screenings) is $100. Memberships must be purchased prior to the event. Closing night party [secret location TBA].